What’s missing from this picture of Pompeii, outside of Naples in west central Italy? I visited both sites this summer, and was struck by some of the differences. First, what they have in common: Both towns were satellite Roman communities that were snuffed out in AD 79, when the volcano Vesuvius erupted violently. Those residents who didn’t escape during the early stages of the eruption were buried. Almost two thousand years later, their remains may be viewed in the context of the archaeological sites their towns have become. The difference between the two photos above is that at Pompeii, excavations have removed almost all the pyroclastic material (ash and lapilli) that killed the people and preserved the town. At Herculaneum, much of it remains in place. While Pompeii pokes out into the air as you might expect a village to, Heculaneum feels like an excavation: it’s a hole in the ground. The walls of that hole are pyroclastics that the surrounding city have been constructed upon. Today, let’s explore both sites together. There are plenty of vantages of Vesuvius, the great threat, off in the distance. It’s a beautiful place – hauntingly beautiful if you think about what happened here. These striking forms resulted when human beings (likely slaves) were buried by a pyroclastic flow. The pyroclastics were already meters deep at the time of their demise, and their masters had likely fled the city. The slaves’ bodies rotted away over time (save for some bone material) and yet the surrounding envelope of ash had enough structural integrity to remain standing and preserve the shape of their bodies. Later infilling of this external mold with plaster of Paris created a cast of the original three-dimensional shape of their bodies. This is the only pyroclastic material I observed in Pompeii; everything else must have been cleared away – and a tremendous amount of it, too. It seems to me that there is a missed opportunity for some geological education here. By seeking not to obscure the gorgeous archaeological features of Pompeii, the geological “murder weapon” has been removed from the scene. Vesuvius can be seen looming in the distance here, too. 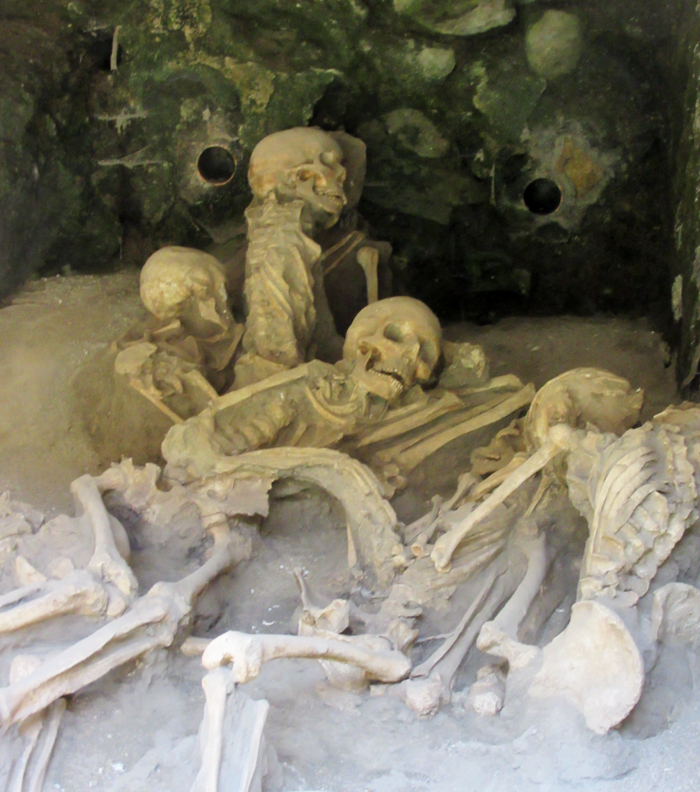 Herculaneum also preserves the bodies of the dead, but here they are skeletons. One of the striking aspects of Herculaneum’s archeology is the preservation of carbonized wood at the site. Here is a bed that still persists, 2000 years after it was built: absolutely remarkable! Both sites are extraordinary windows into the past. They offer views of life during the heyday of the Roman Empire. Each has its strengths. Pompeii is enormous. We walked its streets for six hours in the blazing sun and hardly visited the same spot twice. Herculaneum (the excavated portion, anyhow) is much smaller – only a few blocks. Visitors have greater liberty to enter the buildings at Herculaneum, and it’s less mobbed by visitors. For these reasons, coupled with the visceral sense of being in the volcanic deposit, I think Herculaneum was the more powerful visitor experience. Ideally though, a stronger sense of how this violent day went down can be achieved by visiting both sites in tandem. Awesome share of one of my bucket lists – thanks! Thank you for sharing – my students are given a nice look into the enormous devastation the Vesuvius had caused. And to see the differences between the two cities is really awesome! Excellent article and pictures, thank you! !